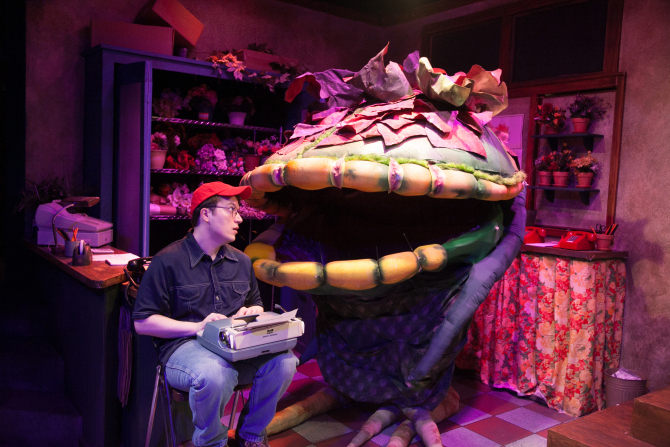 From the moment the actors step onto stage, Little Shop of Horrors takes you on a fun and exciting ride. The heart of the show is Seymour (Michael Mahler), an impoverished orphan living on “Skid Row”, who works at Mushnik’s, a florist store. 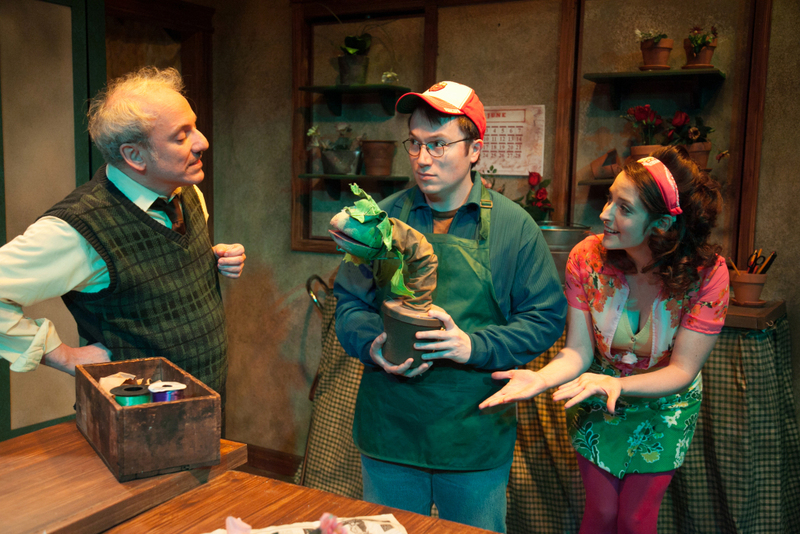 His boss, Mr Mushnik (Mark David Kaplan), is ready to close up shop permanently until Seymour and hot-mess-florist Audrey (Dara Cameron) suggest that he display one of Seymour’s exotic plants in the window. That plant is Audrey II, an alien-looking plant that flourishes after sucking on a few drops of blood from Seymour’s rose-pricked finger. The freaky plant becomes an overnight sensation and gives a sudden taste of fame for Seymour. As Audrey II grows in size, so does its insatiable taste for blood, and wants something more than just plasma – limbs and entrails. Little Shop of Horrors – 1 from American Blues Theater on Vimeo. Director Jonathan Berry devised brilliant ways of playing with space, giving the set a beautiful flow. Performances are solid throughout, and singers Ronnette (Jasondra Johnson), Crystal (Camille Robinson) and Chiffon (Eunice Woods) are soulful and entertaining, garnering much deserved applause after every tune. Rounding out the cast with a memorable performance is the devilish character of Orin, played with fantastic flair by Ian Paul Custer. I highly recommend this show now running at American Blues Theater through June 26, 2016 at The Greenhouse Theater Center, 2257 N Lincoln Ave in Chicago. Tickets can be purchased by phone at 773-404-7336 or online at www.americanbluestheater.com $19-$49. Free post show events will follow select Sunday matinees.